The Sterling by Music Man SUB Ray4, seen here in a sleek Black finish, gives you the opportunity to own a fantastic bass guitar at a great p.. The Sterling by Music Man SUB Ray4, seen here in a sleek Black finish, gives you the opportunity to own a fantastic bass guitar at a great price. With the Sterling SUB Ray4, Music Man provide an awesome bass guitar that is heavily inspired by the classic Music Man Stingray Bass. Get the classic look of the Music Man Stingray with great playability and great sound at a great value price. Featuring active electronics, low-noise humbucking pickups, solid hardware and a minimalist, uncluttered look, the SUB Ray4 has a beautifully distinctive look. The original Music Man StingRay bass has had a huge impact on bass players. A no nonsense yet eye-catching design, great tone from the onboard preamp and great pickups – what’s not to love? Now, with the Sterling range by Music Man, you can get an authentic StingRay experience at a fraction of the cost. 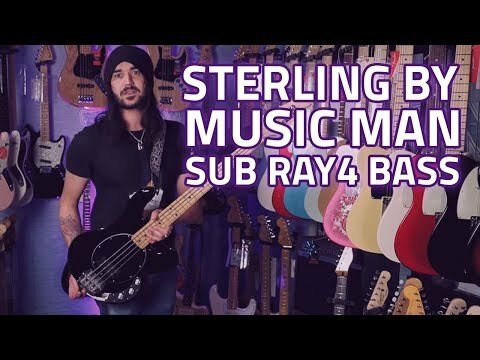 Retaining the classic Stingray look, feel and tone but in a more affordable model, the Sterling by Music Man SUB Ray 4 is a fantastic bass guitar in its own right. Looks aren’t everything, but they definitely help, and so the SUB Ray 4 has kept that beautifully retro look, giving you awesome stage presence. From its distinctive oval pickguard to the open gear tuning machines, the SUB Ray4 oozes vintage aesthetics. Active two-band EQ coupled with low-noise humbucking pickups give you a solid, full-bodied modern bass sound that you can tailor to your own preference. With a Maple neck and matching fretboard, fitted to the body with a classic 6-bolt neck joint, you get silky smooth playability from an extremely secure neck.